celebrating my kids' birthdays is one of my absolute favorite things to do! from choosing a meaningful party theme to putting party favor bags together with love, i love it all! 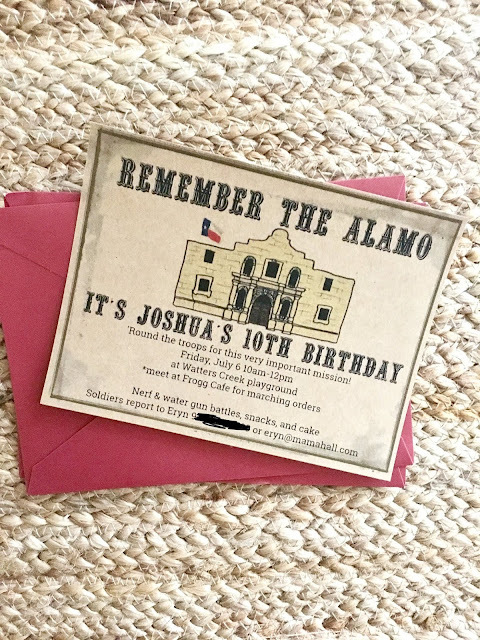 this year, though, for the first time ever, i was completely STUMPED when my son said he wanted an ALAMO themed party for his upcoming 10th birthday. he studied Texas history in fifth grade this year, and fell in love with it! he is fascinated with learning about the origins and heroes of our homestate, and all things Texas. i was inspired by the way he honored and revered the founding fathers of Texas' history, and we support his passion 100%! but an Alamo themed birthday party? wow, okay, son. so naturally the first place i went was Pinterest. nothing. plenty of ideas for a cowboy party or a western party, or even a general Texas party! not much was out there for an Alamo party. but i was determined to make my 10 year old's birthday wishes for an Alamo party come true! here's how i made it happen. INVITATION // i used free clip art images to create the invitation, printed them on craft cardstock, and mailed them in red envelopes with blue/star washi tape. FAVORS // found Alamo army guy figures on Amazon, with Texas Army and Mexican Army guys. there are Davy Crockett and Jim Bowie figurines! yay! i put a handful of guys in each bag. perfect! i also ordered a few dozen small Texas flags and small Mexico flags on Amazon, and the guests all got one of each flag. each guest also took home a bottle of Dublin Root Beer which is Texas-famous and delicious! (found at Target and World Market) i threw in some Chupa Chups lollipops (because, Mexico? ), M&Ms, and Double Bubble gum just for fun. all the kiddos got their own water gun, too, with their names on it. i found the water guns at Hobby Lobby of all places! i liked them because they were big and easy to refill, and i wrote their names on them with red paint pen. a friend of a friend made Alamo and Texas shaped sugar cookies for the party goers. they were PERFECT! they were wrapped individually for each guest. not pictured but also in the goody bags were Texas flag temporary tattoos, Alamo postcards, and a box of Texas-western cookies all found at Texas Treasures in the mall. all the small favors were put in simple brown paper lunch bags with the same blue/star washi tape and i wrote the kids' soldier names on the bags. they were given the water guns and root beer at the party. DECORATIONS // i love to decorate our front entry table for special occasions. for this party, i framed a quote from one of Josh's heroes, Davy Crockett. (not the more famous quote that has the H word in it haha) i put bluebonnets and sunflowers in a vase with a Texas flag, set out a Texas book that we had in our collection, and staged some of the Alamo figures around the table. and of course that sweet baby pic of my precious son! my favorite find (again on Amazon!) was this "Insta-Theme" Scene Setter stone wall vinyl backdrop. it's HUGE! i laid it out on the floor, freehand drew the outline of the Alamo, and cut it out. then, i used craft paint to paint windows and doorways. it was EXACTLY what my son wanted! i took it to hang up at the party, and then hung it up at home for the family celebration. the western looking birthday banner is from Hobby Lobby. there were cupcakes, chips, crepes, cheese balls, candy, and root beer - all of the birthday boy's favorites! thankfully, because his party is near 4th of July, finding red, white, and blue decorations and accessories was pretty easy! the red, white, and blue cupcakes were from Target, and that's also where i found the red, white, and blue M&Ms and Skittles! when the party guests arrived, they were given their pre-filled water gun and the battle of the Alamo began! i think they were all Texas army, though ;) they ran around the playground spraying each other (and me) for hours, stopping only for a quick snack or to refill their water guns. it was fun! even without Pinterest, my birthday boy's wish came true and we will always REMEMBER THE ALAMO themed party! what a fun 10th birthday celebration! "First, be sure you're right - then go ahead."